Wierzbowa Street in Wysogotowa is a local road with a high volume of traffic: there are numerous manufacturing companies located alongside the road, and it provides a short cut between National Road 92 and Provincial Road 307. Repeated heavy loading meant the road was in poor structural condition, with deep ruts and wheel tracking; plus structural damage caused by the ingress of water. The client wanted the road repaired to cope with existing traffic while keeping closure time to a minimum. To resolve the problem, it was decided to carry out cold in-place recycling of the existing asphalt pavement and foundation layer. Nynas Nyfoam 85 foamed bitumen was used to bind the existing pulverised material to form a BituFoam mix and then compacted. Nyfoam 85 is a special product out of the Extra category of Nynas’ products. 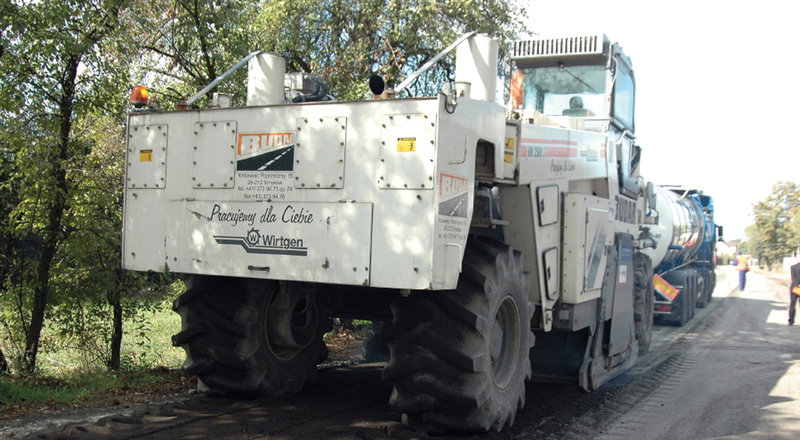 Prior to undertaking the main work, site coring was performed to determine the composition and condition of the pavement. The pavement was found to consist of 6.5cm to 10cm asphalt layers and a 15cm to 20cm thick base layer of blast furnace slag. The foundation and hot mix layers were milled with a Wirtgen 2500 recycler. Nyfoam 85 was added and the manufactured BituFoam mix was laid in-place. The BituFoam was compacted immediately and the surface profiled with a grader. The new BituFoam layer had a thickness of approximately 20cm and was overlaid several weeks later with hot mix asphalt consisting of a 5cm binder layers and a 4cm surface layer of dense asphalt. The application of this technology in Poland was fairly innovative; external guests were invited to view the project demonstration, where cold in-place and hot mix technology were combined. The Nynas BituFoam technology was developed in 1998 in the Netherlands. This was because of a decision by the Dutch government that coal tar containing asphalt had to be taken out of the environment. Hot bitumen is sprayed through a nozzle where water at an amount of 1% to 3% of the bitumen is injected directly into the bitumen. This causes an expansive reaction where the water turns to steam and foamed bitumen is produced. The foamed bitumen has a short lifetime and must be mixed instantly with the aggregates in order to 'wet' the material surface. Foam bitumen binds mainly to the fine particles in the mix. This property of sticking to the finest particles forms a 'fat' mortar with these small particles and this immobilises the leaching by water of hazardous contaminants which may be present in these particles. The viscous elastic behaviour of bitumen present in the foundation layer will reduce reflective cracking the hot mix layers above and therefore reduce ingress of water from the top. The Nynas Nyfoam bitumen range for the generation of foam has unique properties compared with some other bitumens in the market. Nyfoam has a natural tendency to foam; expansion values of 15 and halftime life times of at least 15 seconds are normal. This also means that Nyfoam bitumen does not need the addition of foaming additives. 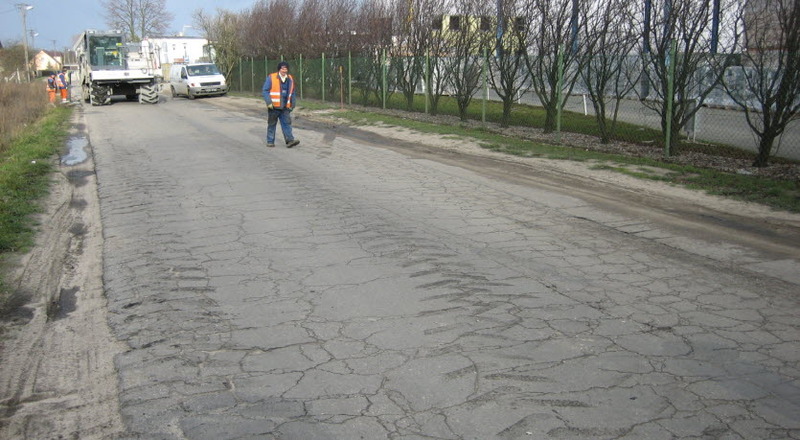 Many roads in Poland are in a poor structural condition requiring immediate attention. The road management bodies often have insufficient budget resources for comprehensive reconstruction. BituFoam technology makes it possible to build a load bearing foundation layer using material obtained from the existing road, which reduces the cost of reconstruction as well as that of transportation of materials. For lower category roads it is even possible to use a double surface dressing to overlay and protect the BituFoam layer – which allows application of a hot mix layer to be delayed until sufficient funds are available. 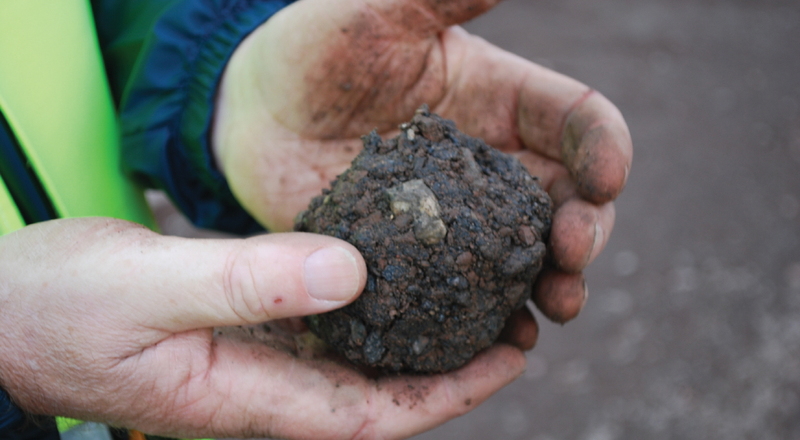 Samples of material were obtained from the old road prior to work beginning. Testing indicated that because of the high coal ash content in the milled layer, circa 20% of new aggregate would have to be added to obtain a better mix gradation. This extra aggregate was laid on top of the road surface and milled in during the pass of the Wirtgen 2500 Recycler. The amount of additional bitumen required was determined at 2.5 mass%, with 2% added water and 1% cement. Application of the recycling technology was being performed for the first time; and the programme was divided into two days. The first day was used to arrive at the optimum parameters while constructing a section of the road. During the second day, a section of the road was laid in the presence of the invited guests. On both days, the road was opened to local traffic almost instantly after the work had been completed. The reduction in the time for which the road was closed to no more than the time taken to perform the actual work, demonstrated a major advantage of the in situ BituFoam application. Additional advantages of this technology came to the fore when it rained on the first day. The contractor, which was used to traditional methods, was surprised that neither the rain nor the puddles of water on the road had any major impact on the quality of the layer being placed. It was possible to obtain good compaction properties rapidly, despite the rain. The day of the demonstration was sunny and the invited guests were able to witness how fast the recycling operation was and how quickly a new, load bearing layer for the road was built. Prior to the demonstration, a meeting was held at the offices of contractor Aprivia SA, where the guests were briefed on the technology in question and the stages of the project’s preparation. Download this information on how Nyfoam 85 was used at Wierzbowa Street, Wysogotowo near Poznan, Poland, as pdf.